I was sorting through some lures the other day and came across my small collection of Ambush Lures and thought them worthy of sharing. These lures are not that easy to locate and to date I have only managed to acquire 9. Given that 5 of those where given to me as gifts by Steven himself will give you some idea of their scarcity. The final photo shows an ALM "Chopper". Australian Lure Moulds(ALM) was a company started by Steven after he had sold Ambush Lures. 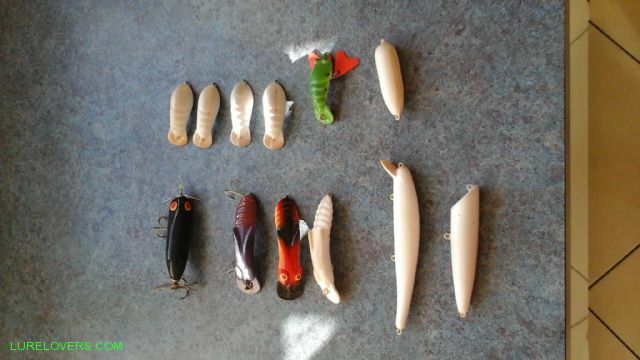 Some moulded lures from the early to mid 1990's. Two "Bullets" - 65mm and 75mm. I believe only a handful of these Trout patterns where done. Col, think I've seen this ALM packaging in MO Tackle? Would that be right? Very nice Col, it reminded me that I had a few tucked away so I dug em out, mostly plastic but a few timbers, thought it would be good to show them so hope you dont mind me adding to this ? . nice lures and paint jobs in their day. Pics are not as good as yours mate . Delighted that you made the effort to add yours Carl. I'm confident that I'm not the only one who is interested in viewing other's collections. Here is another one of Steven's lures that just showed up. I had one of those little spinners on a card aswell Col but it's gone awol, it'll turn up one day . Very nice Allan, love those Millenium Bugs. 65mm, your design ?? awesome little swimmers.